As many of you know, Instagram is my absolute favorite form of social media. I love the creative licensee it gives people. Also, I can't get off of it! I love following bloggers, friends, and other fashion icons. Here are four of my current favorite photos flashing on my feed. 1) The upper left corner is my OOTD from Easter brunch. I loved this look! I haven't worn this dress in forever and I forgot how cute it is. Normally drop waist dresses aren't the best for my body shape but this dress really works for me. 2) Half of these pictures feature my new Blair Waldorf KJP bow bracelet. What can I say, I am genuinely obsessed with KJP! Their accessories fit in perfectly with my style and who doesn't love a great bracelet. This was from a recent OOTD which I wore an adorable Kate Spade Saturday shift dress. 3) Again, another OOTD picture featuring these gorgeous purple flowers I found on campus plus my KJP bow bracelet! 4) The Fashion Show for Iowa State was a few weekends ago and it was such a blast. Check out this post to hear more about it and how I was involved. Also, I got this awesome romper at Akira and it was perfect for the event! 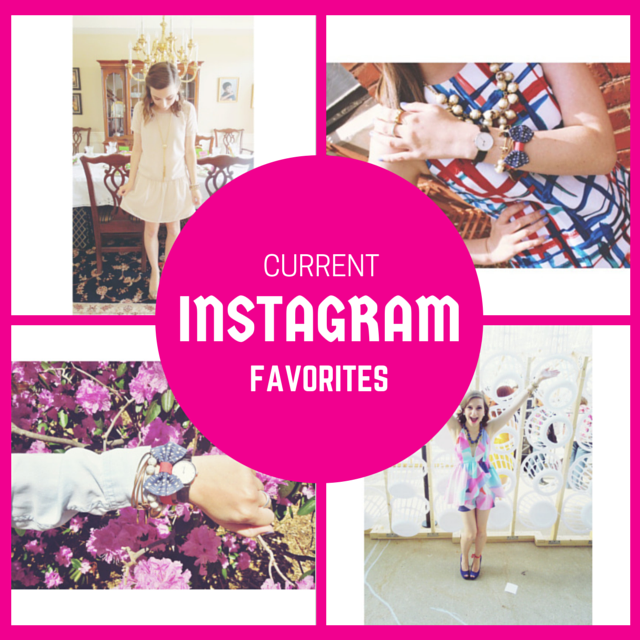 What are your favorite Instagram posts of the moment? Leave a link to them in the comments! It's time for a link-up! Since the Lilly for Target collection just got released, a few of us have teamed up to do a Lilly for Target Link-Up! For this look I paired a bright printed collared shirt with a neon green linen skirt. This skirt is my favorite thing from J Crew! I always find myself reaching for this piece. This bright neon green color is perfect for spring and perfect to pair with Lilly for Target pieces. As for the button down, it is so bright and cheerful. Who couldn't love this print? Most of the things I purchased from the collection is in the multi-colored print. This shirt is not only great for a casual look but it could be transitioned into the workplace. I wore this look for my presentation in class and it was a perfect balance between professional yet casual. Mariah and I had such a fun time shooting these photos! As you can see we took a bunch of candids and were goofing off just a little. Who doesn't love a good powerpoint picture? We always find the best places on campus to take photos. This brick wall turned out to be the perfect little spot for a photo shoot. Jack Rogers are my go-to shoes for summer and spring. They literally go with everything! Also, they are such a classic piece that I know they were a good investment. For accessories I wore a simple stack with Alex and Ani bangles and my pearl KJP bracelet. I also threw on this pineapple hair tie I got in a pack from the Lilly for Target collection. These hair ties are not only adorable to wear on your wrist but also in your hair. Rings: Marley Lilly and Tiffany & Co.
What is your Lilly for Target #OOTD? Link it in the comments! Today, I am telling you all about my skincare routine! When it comes to skincare, I am a fairly simple person. Usually I only use face wash and moisturizer. Sometimes if I feel lazy I will only use a makeup wipe to remove my makeup. When it comes to face wash I usually ALWAYS stick with Neutrogena Oil-Free Acne Wash. I also use a Clean and Clear night time wash in addition to St. Ives apricot scrub! For my moisturizer I use the Clean and Clear dual action moisturizer. Then for my makeup wipes I use the Neutrogena makeup remover cleansing towelettes. I keep my skin care super simple and easy because most often I don't have a lot of time to fuss with much else! But, I haven't had issues with my skin in a long time. So clearly simple products and routine works! But, I recently added OZ Naturals serum to my routine. You use this serum after washing your face and before you apply your moisturizer. When I first used it I noticed that my moisturizer felt more absorbed into my skin which is great. OZ Natural serum was created to give people a dewy and moisturized look. Not only does this help your skin overall but it helps with wrinkles. I know I am only 19 but this serum does more than wrinkle protection! I have noticed my skin is softer and overall better appearance. Not to mention this product is made in the USA. Want to try it yourself? Click here to order it off Amazon! What is your skin routine? Let me know in the comments! I was sent OZ Naturals skin serum to review from Brand Backer. All reviews on Sew Cute Style are my own opinions and thoughts. Summer is quickly approaching! This week is dead week at Iowa State, so everything is beginning to wind down. It's crazy to think that my sophomore year is almost over! But, that means summer is basically here (which makes me so happy). So the question is, what am I going to do with my summer? Well, here are a few things that are on my summer checklist this summer. Visit my friend Mariah (Chambery and Champagne) in New York City. Visit my friend Emily in TN. Go to Chicago as much as possible. Go to a blogger conference. Actually attempt to get tan. Go to the aquarium (my favorite tradition!). Watch old movies and gain knowledge on past fashion trends. Focus on making my blog the best it can be! Finding luggage for study abroad. Let the countdown for London begin! 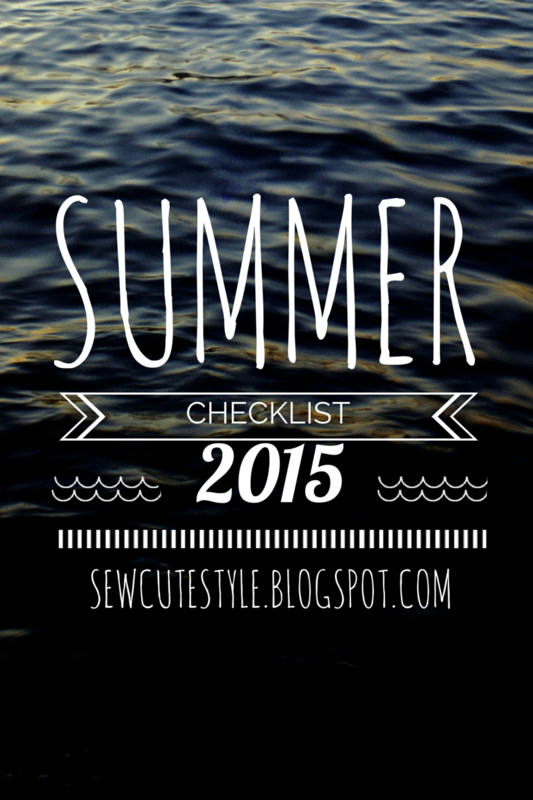 What is on your summer checklist? Let me know in the comments! Hello everyone! The other day I had a great mail day. You heard right a mail day not hair day! I have been ordering up a storm recently. Retail therapy at its finest. But, I picked up this ADORABLE mug from the Trendy Sparrow shop on Etsy. It was on sale for $12 for one day so I had to pick it up. I also picked up an extra one for a gift. I couldn't help but take photos of the adorable packaging. The Trendy Sparrow sure knows how to make something look adorable! I also picked up this limited edition Rowdy Gentleman shirt. I swear sometimes I am a guy in a fraternity. But, none the less, I got this because it was a limited edition masters shirt. Who doesn't love a golf inspired shirt? Have you had a good mail day recently? Let me know what you guys have ordered in the comments! Hello everyone! 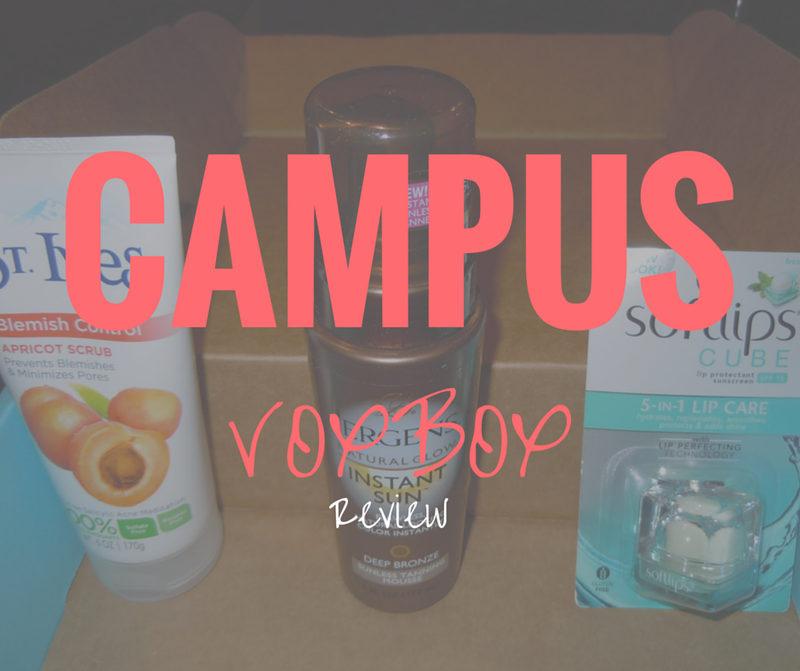 I recently received the Campus Voxbox which features a bunch of great products from brands like St. Ives, Softlips, Jergens, L'Oreal, and Sour Punch! I cannot wait to start using these products and giving you guys some great reviews and thoughts on them. You can expect to see more about all of these products very soon. I actually have been using the Softlips cube for a while so a review for that product will be out within a few days! But, here are some pictures of what was in the box so you can get excited for what is to come. L'Oreal Paris Advanced Straight System, Softlips Cube, SOUR PUNCH PUNCHIES and Rainbow Straws, St. Ives Blemish Control Apricot Scrub, and JERGENS Natural Glow Instant Sun Tanning Mousse. Have you tried any of these products yet? Let me know in the comments! I would love to hear your thoughts! The TR(E)ND (we tried to take a photo with the balloons....) release party was a huge success this semester. From the location to the fabulous decorations to the travel inspired theme this one I would say has been our best one yet! We celebrated our 18th issue with photos, a fashion show, and freebies. I was so happy with the way my spread turned out. My shoot was an accessories based shoot inspired by none other than Gossip Girl. I will be sure to scan in photos of the pages ASAP so you all can see! For the shoot I styled, pulled clothing, decided the location, as well as come up with the overall theme and concept. If you have a student publication on your campus I highly suggest getting involved. Trend has given me so many opportunities to be creative and to show off my skills. Be sure to check Trend out on social media to see more about our magazine! Spring is in full bloom! I found this gorgeous purple floral bush on campus and I couldn't resist snapping a few OOTD pictures. For this look I wanted something comfortable and simple. I had a test so I wanted to wear something that wouldn't distract me while trying to remember facts of apparel production. So, I opted for these adorable printed shorts and a soft chambray button down. This shirt is super soft which makes it the perfect "comfy" day piece. I love pieces that are not only cute but comfortable (win win right?)! For the bracelet stack of the day I chose to go with my Blair Waldorf Vickers Bow bracelet, four Alex and Ani bangles, and an Armed and Readi beaded bracelet. I paired this stack with my Daniel Wellington watch so I wouldn't overpower the bracelets. To say I am obsessed with the Blair Waldorf bow bracelet is an understatement. I just completed Gossip Girl (for the third time.....) so I am taking a lot of inspiration from the show! Not to mention red and navy make a common appearance in my looks so this bracelet matches practically everything! Another current favorite are my anchor loafers. I got these last spring and they are a must have for the summer and spring months. The embroidery and seersucker detail make them the perfect preppy shoe to slip on. 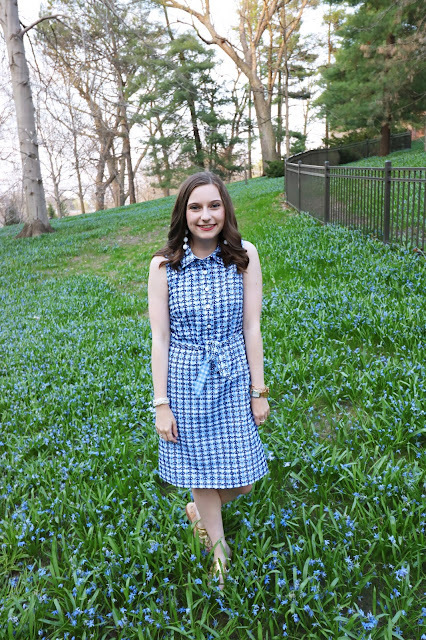 What is your favorite way to wear blue during spring? Let me know in the comments! Krass & Co. shorts are one of my favorite "comfy" clothing pieces! A while back I snagged a pair of the Sarahbelle93x limited edition shorts and I am obsessed. They are perfect for working out, walking around campus, or just laying in bed all day (aka every Sunday). Like Krass & Co. on Facebook to keep up to date! In addition to shorts, Krass & Co. will be adding lots of new products soon! Including more men's shorts and other secret goodies. Be sure to keep checking back to find the new stuff! Here are my Krass & Co. shorts! The quality on these shorts is actually fabulous. Personally, I like these shorts better then traditional Nike running shorts. To add they are way cuter! There are a TON of different prints, patterns, and colors to choose from so there is something for everyone. Also, the have sorority affiliated products that are perfect for your big, little, or yourself! Be sure to check out Krass & Co. What is your favorite pair of shorts? Let me know in the comments! Well here it is! Here is EVERYTHING I got from the Lilly + Target collection! Although I did leave out one bag (Might return, find a friend who wants it, or just put it up on eBay. Not sure yet!). I am so happy with all of the pieces I got from the collection. Although I wanted more shift dresses I scored this gorgeous blue and white dress! It wasn't my favorite online not going to lie. But, in person it is adorable. I also picked up a few kids items. One of the many perks of being a shorty is getting things for lower prices! I found this dress in addition to a pair of shorts, white crop top, and a romper all in the kids department. This maxi dress will be perfect for a summer night! You could even throw on a jean jacket and wear it to work. These are the home items I picked up! All of these wonderful pieces are going to be perfect for my apartment next year. I plan on getting a bar cart to showcase the adorable glasses and giraffe bottle opener. Then the puff and pillows will be in my room for decoration! This tote was only $15 and it is adorable! I know it isn't everyones cup of tea but I think it is just darling. I love the combination of prints plus the metallic gold strap. I snagged a BUNCH of accessories! Some of these are gifts but I scored three headbands, hair ties, bobby pins, a makeup bag, and flip flops! These small items are going to be the perfect touch to simple outfits. This tote. OMG. This may be my favorite piece that I bought! This bag is gorgeous. I love the bright color and the scarf tie on the side. Also, who doesn't love some pineapple hardware? Here are the two pairs of shorts I got. The light blue ones are from the girl's department then the darker blue shorts are from the women's department. I also picked up this blue, white, and pinks scarf. This will be great for chilly summer nights! This blouse is super cute! It will be great to wear to work in the future. Then the best buy of them all...... the mugs! These mugs were a huge favorite of mine from the beginning. Mariah my shopping mate scooped up the only sets. There were two sets in the whole store and we got them! Major score. What did you get from the Lilly + Target collab? Let me know in the comments!